A beautiful leopard print wine holder shoe with embroidered accents from Globe Imports. A beautiful snow leopard print wine holder shoe with embroidered accents from Globe Imports. Show of your favorite vintage of wine with this Red and Leopard patterned wine bottle shoe holder. Pink Sequin Rose High Heel Wine Bottle Holder This is the most glamorous high heel wine bottle holder we have. 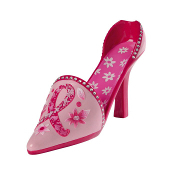 A pink sequin shoe that holds your wine glass in the my glamorous way. Holds one full size wine bottle Adorned with pink Sequins Display your favorite wine in this fashionable wine shoe. 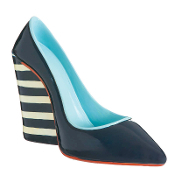 Dark blue with a light blue inside and stripes, this shoe invokes a sense of sailing. A great addition to any nautical themed home. Wild Eye Designs Camouflage High Heel Wine Bottle Holder This wine bottle holder is sure to catch the eye of any visitor. It'll attract looks and compliments for its creative yet sophisticated design. Don't wait to add this elegant piece to your... Display your favorite bottle of wine at Christmas time in this fashionable high heel bottle holder. 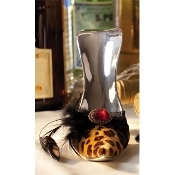 Show off your favorite wine bottle this Christmas with one of Ganz's high heel bottle holders. Made of quality polystone, holds a full size bottle of wine. Diva, show off your bottle of fine wine with a high heel shoe which accents your wine bottle the same way high heels accent your legs. 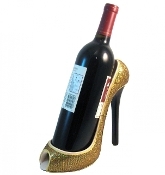 Make your vino irresistible with our sassy high heel wine bottle holder. High quality high heeled shoe wine bottle holder. Available in 3 different colors and patterns. Holds a full size bottle of wine. High heeled wine shoes, available in cream or pink. Made of high quality polystone material. Very decorative, perfect for that fashionable wine lover! Holds full size bottle of wine. 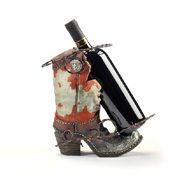 The Western Boot Wine Bottle Holder makes for an entertaining wine rack. This wine shoe will be the life of any ol' rodeo. These western wine boots are a must have for the cowgirl wine diva. The High Heel Wine Caddy is a show stopper for any shoe-a-holic! Made from resin, this high heel bottle holder will hold any standard sized wine bottle. Wine Caddy is a great gift for any fun loving gal. 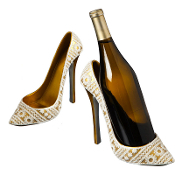 Great idea for a gift or party, this stylish high heel shoe holds a standard size wine bottle. Available in Gold or Silver. The High Heel Wine Caddy is a show stopper for any shoe-a-holic. Made from resin, this high heel bottle holder will hold standard sized wine bottle. 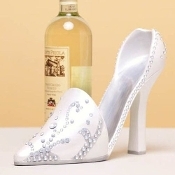 This Classic Stiletto Shoe Wine Bottle Holder looks fabulous adding just enough sparkle to dress up your wine. Both sassy and fun, this wine bottle holder will bring a wild side to any party. Simply set the bottle in the shoe and enjoy. 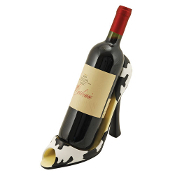 This Cow Print High Heel Wine Bottle Caddy brings your wine to new heights with a black and white cow print peep-toe pump. Simply set the bottle in the shoe and enjoy. Both sassy and fun, this wine caddy will bring a wild side to any party. The High Heel Wine Caddy is a show stopper for any shoe-a-holic. Made from resin, this high heel bottle holder will hold standard sized wine bottle. Caddy is a great gift for any fun loving gal. Collect all seven High Heel Wine Caddy’s today This Sparkling High Heel Shoe Wine Bottle Holder looks fabulous adding just enough sparkle to dress up your wine. Both sassy and fun, this wine bottle holder will bring a wild side to any party. Simply set the bottle in the shoe and enjoy. Thank you for browsing our collection of Wine Shoes.